DETROIT (AP) The Detroit Pistons have beaten several of the NBA’s top teams this season. Without James Harden, Houston might not qualify for that distinction – but it was still a nice victory for the Pistons after an awful loss the night before. 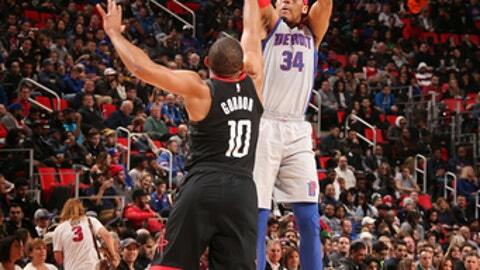 Tobias Harris scored 27 points, and the Pistons held on for a 108-101 win over the Rockets on Saturday night. Detroit lost 114-78 at Philadelphia the previous evening, but the Pistons used a strong third quarter to outlast Houston. Detroit is only four games over .500, but the Pistons have beaten Golden State, Boston, San Antonio, Minnesota and now Houston. The Rockets are without Harden, but the Pistons were missing their own standout, with Andre Drummond sidelined because of a right rib contusion. As usual, Houston relied heavily on 3-point shooting. The Rockets went 7 for 13 from beyond the arc in the first quarter, but were only 8 for 34 after that. Detroit was the more efficient team from 3-point range, going 12 of 25. Chris Paul had 16 points and 13 assists for Houston. Ish Smith scored 17 points for Detroit, and Dwight Buycks added a career-high 16. There were eight lead changes and six ties in the first half, and Houston led 58-57 after two quarters. Detroit then outscored the Rockets 31-19 in the third. A dunk by Harris put the Pistons up 72-65, and Reggie Bullock’s 3 near the end of the period made it 86-72. Houston rallied late and cut the deficit to four with 15.5 seconds left, but Smith made two free throws for Detroit at the other end. Rockets: Harden is out with a hamstring strain. Houston was also without C Nene, who has a bruised right knee. Pistons: In addition to Drummond, Detroit was without G Reggie Jackson (sprained right ankle) and F Stanley Johnson (strained right hip flexor). … Eric Moreland replaced Drummond at center for the first start of his career and set career highs with eight points, four assists and 36 minutes. Detroit is 5-2 in the second game of back-to-backs after going 3-14 last season. The Pistons had reason to be ready Saturday. The Rockets went 4 for 21 from long distance in the second and third quarters. Van Gundy isn’t thrilled with how backup center Boban Marjanovic is being officiated. At 7-foot-3, Marjanovic can be tough to defend, and he had 10 points on 4-of-8 shooting. Rockets: Visit the Chicago Bulls on Monday night. Pistons: Visit the New Orleans Pelicans on Monday night.